The word Astrology comes from the green word astron meaning "constellation" or star", and logia which means "the study of". Astrology is defined as the study of the positions of celestial bodies such as the sun, moon and planets, along with related details, in the belief that their movements either directly influence life on Earth or correspond somehow to events experienced on a human scale. There are numerous traditions and uses for astrology that have arisen since it's earliest recorded beginnings. The study of the Sun, Moon, Planets and Stars began well before mankind's earliest written records. There are even fossils that date back to around the ice age that have notches carved on them to indicate the phases of the moon. Early sky-gazers carefully observed and studied the heavens and began charting the apparent movement of the stars and Planets. Calendars were developed for marking the measuring and passage of time. In some ancient societies astrology was mixed with religion and these astrologers were actually considered priests. Over time celestial patterns emerged and was possible to predict the recurrence of cosmic events such as eclipses and moon phases, and these celestial bodies were seemed to have an effect on earthly phenomenon such as weather, plant growth, and other terrestrial events. 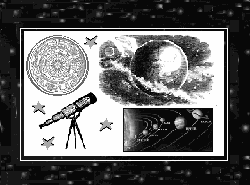 The early astrologer-priests then began exploring the concept that by observing the heavenly bodies it would be possible to predict the fate of the human being by casting a Horoscope (Natal Chart), which was a chart of the positions of the celestial bodies at the time of ones birth. This new science of the heavens eventually branched out into other areas of the world, mixing and merging with other astrological methods and eventually developed into the basic forms of Astrology that are still used to this day. The basis of Eastern Astrology is the Lunar Cycle. Western Astrology follows the Solar cycles.